This young artist and philanthropist started the Eastside’s Creative Children for Charity — or 3C, as he likes to call it — when he was 8 years old. His mission was to support nonprofits by uniting kids through community art and leadership programs. The group endeavors to inspire 1 million kids and teens to donate their time and talents for social causes through creativity. To date, 3C has donated more than $10,000 to various organizations, from well-known national nonprofits like Make-A-Wish, to local causes like the Sammamish-based SAMMI Awards Foundation. Moreover, Vedullapalli has personally raised and donated more than $20,000 by selling his art — mostly acrylics on canvas — and teaching 3D-printing classes to other youth. 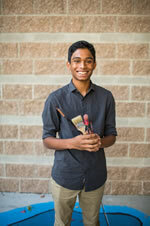 Chirag is Biz Fair’s youngest instructor in Biz Fair’s 22-year-history. Take his “3D Printing for Small Business” class.